This is a pun with the sound of INE い（寝）ぬ, to sleep. is the Japanese word for the first dream had in the new year. Traditionally, the contents of the dream would fortell the luck of the dreamer in the ensuing year. In Japan, the night of December 31 was often passed without sleeping, thus the hatsuyume was often the dream seen the night of January 1. This explains why January 2 (the day after the night of the "first dream") is known as Hatsuyume in the traditional Japanese calendar. It is considered to be particularly good luck to dream of Mount Fuji, a hawk, and an eggplant. This belief has been in place since the early Edo period but there are various theories regarding the origins as to why this particular combination was considered to be auspicious. One theory suggests that this combination is lucky because Mount Fuji is Japan's highest mountain, the hawk is a clever and strong bird, and the word for eggplant (nasu or nasubi 茄子) suggests achieving something great (nasu 成す). Another theory suggests that this combination arose because Mount Fuji, falconry, and early eggplants were favorites of the shōgun Tokugawa Ieyasu. Although this superstition is well known in Japan, often memorized in the form Ichi-Fuji, Ni-Taka, San-Nasubi (一富士、二鷹、三茄子 / 1. Fuji, 2. Hawk, 3. Eggplant), the continuation of the list is not as well known. 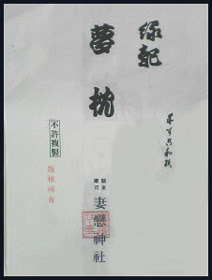 The continuation is as follows: Yon-Sen, Go-Tabako, Roku-Zatō (四扇、五煙草、六座頭 - 4. Fan, 5. Tobacco, 6. Blind Musician). The origins of this trio are less well known and it is unclear whether they were added after the original three or whether the list of six originated at the same time. "First Princess", "Hime Hajime　姫初め" and sometimes used in senryu. The best view of Mount Fuji is from 三保松原 Miho no Matsubara in Shizuoka. There were also the eggplants grown and brought to Ieyasu as an offering of "hatsumono", first things of the season. The special round eggplants grew well in the volcanic soil of this area. 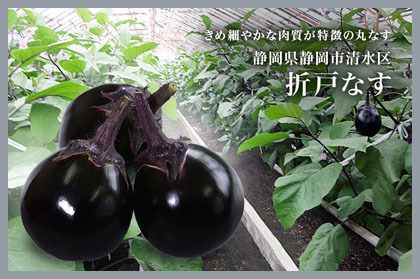 During the Edo period, the eggplant was quite small, but now grown in hothouses, they get big and delicious. Remembering one's dream during the first three days of the New Year is important in Japan. There are various explanations as to why Mt. 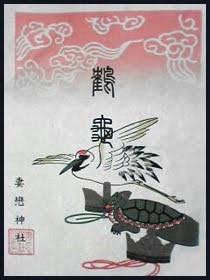 Fuji, the hawk and the eggplant are considered auspicious items to dream about. The first dream of the New Year (generally on January 2nd since people often stay up all day New Year's Day) is regarded as an omen about how the rest of the year will go. The belief goes back at least as far as the fourth century because a historical document refers to a this type of dream by Emperor Suinin. 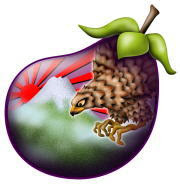 The three best dreams you can have, in order, are about Mount Fuji, hawks and eggplants. Mount Fuji is the tallest mountain in Japan and is considered sacred. Hawks refer to another mountain called Ashitaka that is about half as tall as Mount Fuji. 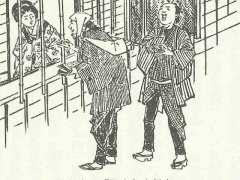 The eggplants, oddly enough, were added to the list to poke fun at high prices in ancient Japan. The first dream of the new year is supposed to foreshadow one's fortunes for the next twelve months. 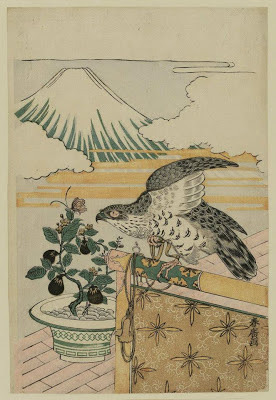 Dreams of Mt.Fuji, a hawk or an eggplant are considered auspicious, because all three of them were said to be high: Fuji being high in altitude, hawks high in flight, and the price of eggplants extaordinarily high when this tradition began 400 years ago. To induce an auspicious dream, you put a picture of this object under your pillow. 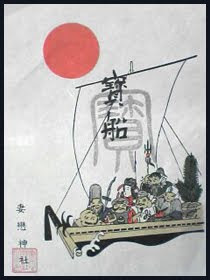 To dream about the Seven Gods of Good Luck (shichi fukujin) was also considered auspicious. Visiting the temples of these gods (shichi fukujin mairi) was a practise during the New Year Holidays. the lunar month of yayoi. What do you do if you have a nightmare or a dream about being poor during the first three days of the New Year? 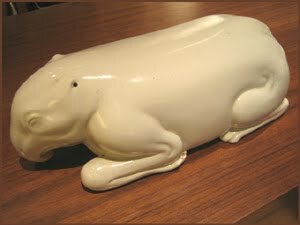 You put the picture of a tapir under your pillow. 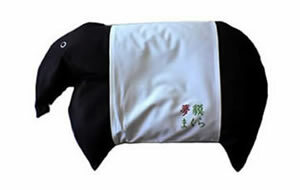 A tapir (baku) is said to eat bad dreams and therefore especially helpful during this season. 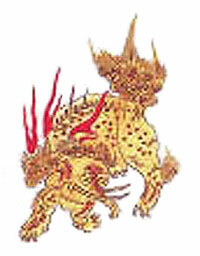 The BAKU is not a living animal of Japan, but during the Edo period became known through the talk of travellers. Pure imagination painted this fabulous BAKU, later identified as a tapir. 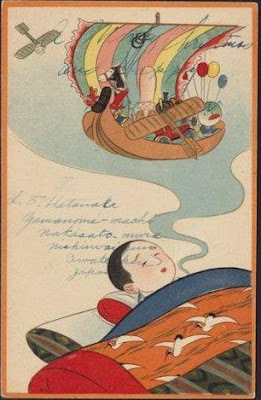 yumemakura, yume makura　夢枕 "dream pillow"
It is a set for the New Year, with the Seven Gods of Good Luck in the Treasure Boat on one and the Tsurukame Crane and Turtoise for long life on the other. 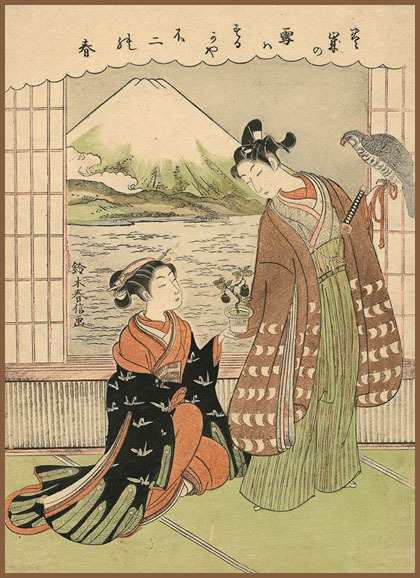 The woodblock for these prints dates back to the Edo period and has been treasured over many years. legends about makuragami 枕神 "god of the pillow" . first dream . . .
. All kinds of dreams, March 2012 .
. Shiki Monthly Kukai, March 2012 .
. Dreams and Nightmares . I'm the same Pris from WHCmultimedia. I had my first dream on the new year last night and paid attention, thanks to you. There were two parts..in the first, a settlement was being made with money. I received a substantial amount from a judge making these decisions. It gave me enough to live on, despite health issues. Then, I was leaving a bad situation (which I'm in realistically) and traveling with an old friend into a happier place. The feeling was one of such strong relief to finally escape the prison I'd been in. Thanks for sharing this custom with me. Indeed, readers may find some of the dreams—and the haiku—predictable. For example, while one poet is making slow progress on a musical composition, she has the same dream every night. She’s fleeing her apartment, which is on fire. She climbs down into an alley filled with smoke, but cannot reach the clearing ahead. Her dream ends. Needless to say, when she finally finishes her composition, the recurring dream ends. While this is certainly a powerful experience for the poet, I think the reader will have anticipated it. This highlights the key difference between dreams and poetry. Dreams exist for the dreamer. On the other hand, haiku need to be finely wrought—for they are for the reader too. I can still remember the first time I dreamt in Dutch ... an unexpected surprise, needless to say, and a definite indication that I had finally mastered the language and that it had seeped into my unconscious. It didn't happen near the New Year, but within the first year after I had emigrated; in a way, also a new year. According to the prescript this haiku was inspired by a dream of Kikuto, one of Issa's haiku students. Kikuto dreamed that he saw Issa's corpse in a river, tied to a rope being held by a child; Issa zenshu^ (Nagano: Shinano Mainichi Shimbunsha, 1976-79) 3.63. I have revised my translation based on that of Makoto Ueda, who reveals that hamenan is a form of the verb hamu: to eat or to feed on; Dew on the Grass: The Life and Poetry of Kobayashi Issa (Leiden/Boston: Brill, 2004) 68. This is not a haiku for the new year! "first dream . . .